Prominent & Leading Manufacturer from Mumbai, we offer gravity fall metal detection systems and gravity feed metal detector for spices. 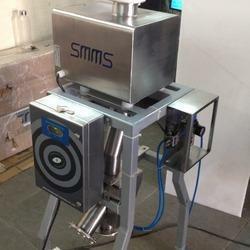 SMMS metal detection systems specially designed for powders and free flowing products which can be passed through Metal Detector through gravity, Gravity Fall Metal Detection Systems can be installed after sifter and the powders or granules can be passed before packaging; these are designed to deliver minute and accurate metal detection before product packaging. Accurate metal detection in high flow lines. Ideal for Granular, spices and powdered products. Designed to detect metal contamination in dry, powdery or granular free-flowing products that can be gravity fed through a pipe, Gravity Feed Metal Detector for Spices has a compact design. This detector offers high sensitivity with high throughput and comes in normally round configurations. It is designed to minimize system space and product waste while ensuring maximum sensitivity to all metals with a wide application in bulk drug & powders.